Bond, M, and the estate’s old gamekeeper Kincaide (Albert Finney) prepare for the inevitable assault with a charmingly dark twist on Kevin McCallister’s booby-trapping exploits, with an armor-plated Aston Martin DB5 replacing a train-hopping Michael Jordan cutout. With the stage set, all the three armed stalwarts can do is wait. A nice thing about the latest entries in the James Bond series is that brand tie-ins are so heavily promoted that it’s very easy for a fan to replicate 007’s style… given that said fan has enough money and advance notice. One of the most popular outfits worn by Daniel Craig in Skyfall was his casual attire while facing off against Silva’s baddies, and it’s been nicely covered by both James Bond Lifestyle and The Suits of James Bond. The olive Barbour jacket worn in these scenes has become especially sought after. 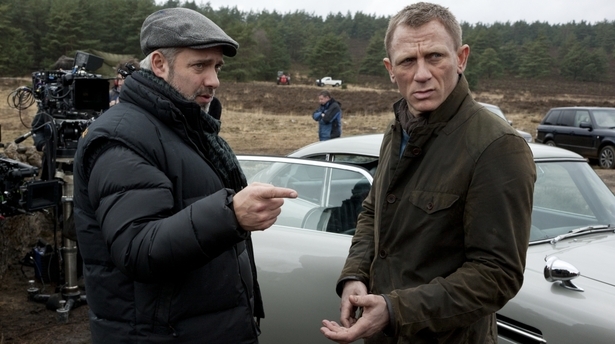 Daniel Craig takes some direction from director Sam Mendes on location. Bond’s jacket is a Barbour “X To Ki To”, a limited edition designed by Tokihito Yoshida for the brand’s Beacon Heritage line. Constructed from 6 oz. Sylkoil waxed cotton, the sports jacket is olive brown – the only color available for this particular jacket – with Barbour’s distinctive tartan lining. The front of the jacket is single-breasted with two buttons closely placed near the lower torso, where a jacket is traditionally buttoned. A third button is further up at mid-chest. There is also a button at the top which Bond leaves unbuttoned. Bond stands ready for action in front of Skyfall Manor. The Barbour “X To Ki To” has a button-flapped breast pocket and bellowed hip pockets that also close with a single-button flap. The ventless back of the jacket features two zip “poacher pockets”, which originated as a sneaky way for poachers to hide their ill-gotten game on their person. With Bond in a combat situation with no central base, it’s smart for him to have as many pockets as possible for ammunition and other accessories. The Barbour’s “poacher pockets” are seen on the back of the jacket. The jacket was designed to protect its wearer in inclement weather with a weather flap under the lapels and a leather, triangle-shaped throat latch, as well as a large hood that was removed by the Skyfall costume team for Daniel Craig. It’s not unreasonable to assume that Bond would modify his jacket like this for an action-packed showdown when a hood flapping around may just slow him down. The same soft olive leather is also present on the jacket’s shoulder patches, elbow patches, and cuff edges. This timeless – and very British – jacket is a nice nod to Skyfall‘s consistent message to the values of “[doing] things the old-fashioned way”. It’s also a functional garment for its place and context. More details about the X To Ki To can be found at James Bond Lifestyle. The Barbour “X To Ki To” quickly sold out due to its association with Skyfall (and the fact that it’s a damn nice jacket) so Barbour rolled out its Dept. B Commander jacket in July 2013 to meet the growing demand. James Bond Lifestyle nicely compared the Commander jacket – which JBL notes was renamed “Beacon Sports Jacket” in December of that year – to the original X To Ki To. The Commander appears to be a simplified version of the X To Ki To without the hood that had been removed for Skyfall. Rob Delaney would wear this later Barbour jacket on his show Catastrophe. Scotland has a famously cool, wet climate with a mean that doesn’t exceed 55°F even in its warmest summer months. Bond wisely layers beneath his jacket to keep himself warm but not too bundled as he hops between DB5, manor estate, secret passageway, swamp, and chapel. Bond’s layers keep him warm but mobile. For the 2012 season we developed a color named “Blue Wave”. It was one of a series of colors that was intended to evoke the spirit of the Scottish Highlands – vibrant colors but in muted tones that reflect the harshness and beauty of both the landscape and weather of a Scottish winter… The “Blue Wave” was not therefore designed specifically for Bond – but its conception and intention fitted perfectly with both the “Blue” theme of Skyfall and the Scotland Highlands where the sweater was to be worn. By sheer chance we have designed and developed a shade that was perfect for the movie. Skyfall begat a collaboration with both Daniel Craig and the James Bond franchise. When Spectre was announced to the press in December, Dan wore the same Oxford Round Neck sweater, although it was technically in “Imperial Blue” rather than the more vibrant “Blue Wave”. 007 also sported three N.Peal roll neck sweaters in Spectre in blue, charcoal, and gray. Tied and tucked into the sweater is a dark brown wool scarf from Tom Ford (though I’ve also heard John Varvatos). Between the sweater and his skin, Bond wears a white long-sleeve henley from All Saints that is best seen when preparing dynamite in the Home Alone-like sequence and later when he disappears into the manor’s priest hole. The Hoarders team halted their work at Skyfall Manor after finding random sticks of dynamite in every nook and cranny of the house. While £425 might sound steep for a pair of leather boots that would just get inevitably ruined by tromping around in the Highlands, Bond requires the best. He wears a pair of dark brown Crockett & Jones “Islay” full-brogue derby boots constructed from scotch country calf. The wing-tip boots have, as James Bond Lifestyle describes, “bold punching detail” and Dainite rubber soles with storm welts. They are laced through four eyelets with five metal hooks up the front shaft. Not only do the boots look good with the outfit, but they’re regionally appropriate given the Scotch country grain calf leather and the evocative “Islay” model name; coincidentally, Islay is also my favorite region for Scotch whisky. Bond continues to wear the same Omega Seamaster Aqua Terra Mid Size Chronometer, reference number 231.10.39.21.03.001, in a stainless steel 38.5 mm case on a stainless bracelet. The watch’s blue dial is decorated with the Teak Concept pattern with a 3:00 date window. Scratch-resistant or not, that crystal’s gonna be shattered if the dynamite goes off with the watch right there! Bond finds himself in some heavy combat situations, both in and out of the water, so the scratch-resistant sapphire crystal and 500-foot water resistance come in handy! 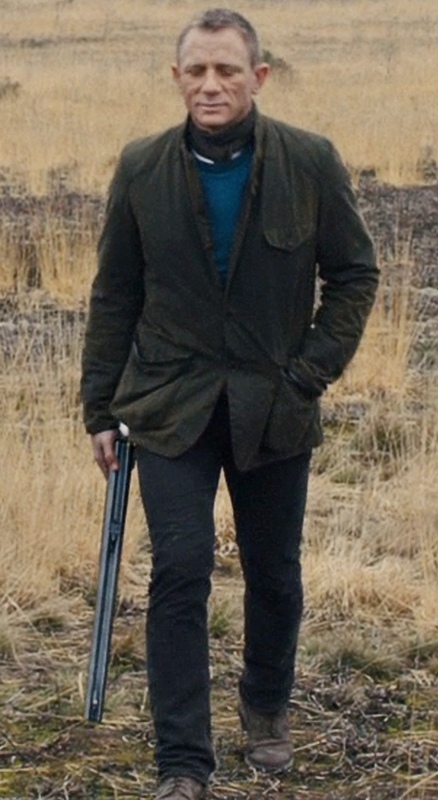 Bond’s Barbour jacket is interestingly a microcosm for Skyfall itself – timeless, rugged, and definitively British. With the rest of the outfit, he looks ready for battle… or at least a comfortable cool day in the highlands. Rather than modifying a Barbour “X To Ki To” with a removed hood and tabs, you could pick up the Commander and/or Beacon Sports Jacket developed to honor Commander Bond’s popular jacket from Skyfall. Iconic Alternatives has a great rundown of affordable options to channel elements of this, such as the sporty jacket, blue sweater, dark corduroys, and brogue boots, and many other 007 outfits. Although he still has his familiar Walther PPK, Bond chooses to arm himself for the final battle with a fascinatingly different firearm – a stunning Anderson Wheeler double rifle chambered for the powerful .500 Nitro Express round. According to Skyfall, the rifle had belonged to Bond’s father, Andrew Bond, who had passed away in the early 1980s but left his mark on the weapon in the form of his monogram “A.B.” plated on the stock. This is yet another strongly British item to appear in the sequence as Anderson Wheeler is based in London and the .500 Nitro Express big bore round had been developed in the U.K. sometime in the 1860s. Bond takes aim with his father’s Anderson Wheeler Double Rifle. The movie’s armorer acquired the rifle from London based gun and rifle maker Anderson Wheeler. The request was for a gentleman’s big game hunting rifle, also known as a ‘double rifle’. Anderson Wheeler provided a 500 Nitro Box Lock Express Rifle, which loads a .50 calibre round that fires a 570 grain bullet at around 2,200 feet per second. A man’s man doesn’t feel when a .500 Nitro Express cartridge is fired merely two feet away from his face. Or he’s really good at hiding it. Anderson Wheeler’s double rifle barrels can be fitted to 24 to 26 inches with a 4mm ivory bead moon-sight on the front sight that can be folded over the 2mm silver bead based on shooting conditions, and the stock is manufactured from hand-rubbed, oil-finished Turkish walnut. Some men are coming to kill us. We’re going to kill them first. As today is Black Friday, the biggest shopping day of the year, a Barbour jacket may be something worth keeping in mind for any well-dressed gents in your life… or perhaps it’s the time you nudge a loved one that you wouldn’t mind one for yourself! Today is also often commemorated as a major hunting day – at least here in western Pennsylvania – so this would be some very sporting attire for a day out in the woods. Very interesting perspective, and thanks for the nice comments! It’s certainly a different Bond than long-time fans are used to. If you do happen to catch one of Craig’s Bond outings, feel free to share your thoughts here!